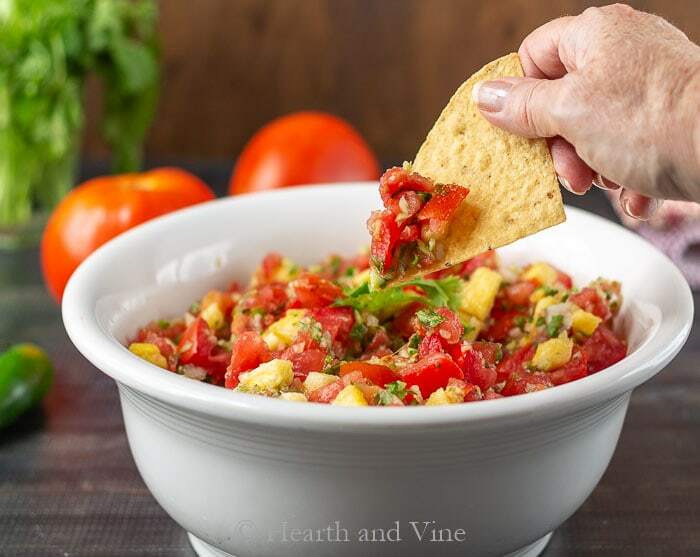 This fresh tomato pineapple salsa is a great way to utilize your tomato harvest, and the added pineapple gives extra tangy sweetness. This recipe is adapted from one my sister created over 20 years ago. I’ve made it with mangos and peaches and I’m using pineapple. Adding any one of these fruit options give the salsa a nice sweetness and a pop of color. In the recipe, I suggest using 1-2 jalapeno peppers but it’s really a matter of taste. Although I love the flavor of jalapenos I find that it is difficult to determine just how hot they will be. Did you ever notice that sometimes they are really hot and others, not so hot? It turns out that they really do vary on the heat index scale. However, this article tells us that age has something to do with the heat level. In this batch, you can see that the peppers are smooth and even though I used 2 peppers the salsa was not very hot at all. I’m hoping this theory will unlock the mystery so I can control the heat in the future. My sister’s original recipe calls for plum tomatoes. They are perfect because they are so meaty and don’t have a lot of liquid or seeds. Still, if you are growing or have access to fresh standard beefsteak type tomatoes you can use them too. Just take a moment to squeeze out the juice and seeds before chopping up the flesh. Around here we wait all summer for fresh tomatoes. Then come August there is a glut of tomatoes to use or freeze. I love using them in Fresh Tomato Basil Pasta, and this fresh tomato pineapple salsa is perfect too. Clean tomatoes and squeeze out extra juice and seeds. Chop small. Combine tomatoes and pineapple in a large bowl and set aside. In a food processor, chop garlic and jalapeno peppers. Add onion and cucumbers. Pulse. Add cilantro leaves and pulse again. Combine the ingredients from the food processor to the bowl of tomatoes and pineapple. Add salt and mix well. This will keep for several days in the refrigerator, though you may want to drain any accumulated liquid. Hi Patti, my father in law use to say that when the japaño has a tiny brown marks, very tiny, the peper is very hot. less marks mean les hot. the salsa is delicious, thanks. Thanks Leticia. That’s good to know! Now you’ve got my attention I love the mango salsa so this because pineapple is a true favorite here would be amazing. Pretty healthy snack too which is perfect as I’m ready to embrace an extremely natural diet. Thanks! Mango would be so awesome too, Carole!